Introduction: Single port laparoscopic surgery (SPLS) has been introduced into different surgical specialties as an effort to further decrease the trauma of access to the abdomen. As a result, there is an evolving stream of technology and instrumentation designed to enable performance of these procedures. The development of articulating and bent instrumentation permits triangulation intracorporeally despite the close proximity of several instruments via a single port. 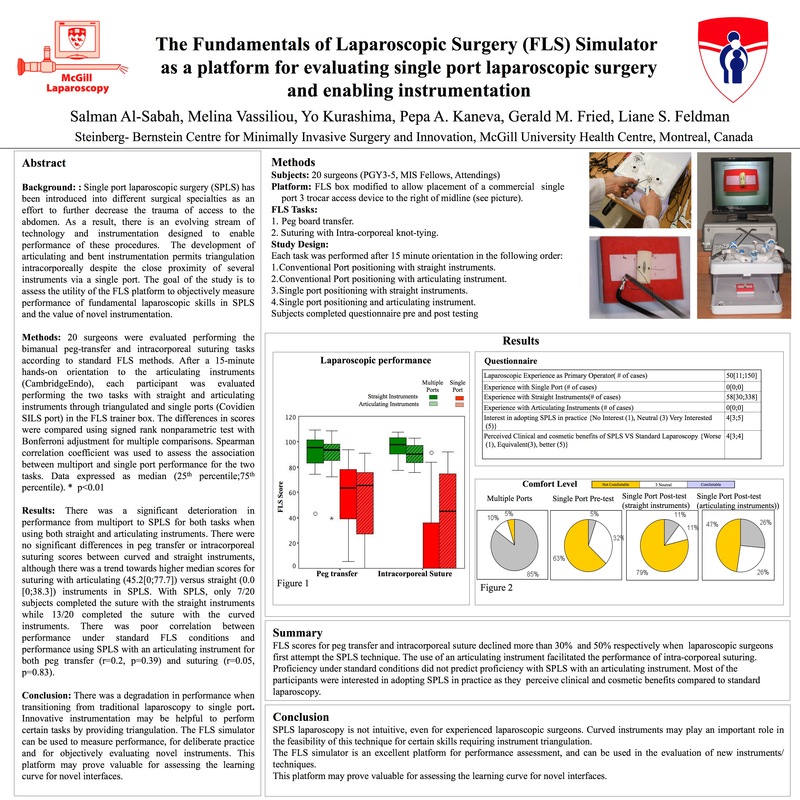 The goal of the study is to assess the utility of the FLS platform to objectively measure performance of fundamental laparoscopic skills in SPLS and the value of novel instrumentation. Results: There was a significant deterioration in performance from multiport to SPLS for both tasks when using both straight and curved instruments (Table). There were no significant differences in peg transfer or intracorporeal suturing scores between curved and straight instruments. With SPLS, only 4/12 subjects completed the suture with the straight instruments while 7/12 completed the suture with the curved instruments. Although there was a trend towards higher median scores for suturing with articulating (50.3[0;81.8]) versus straight (0.0[0;51.4]) instruments in SPLS, this difference was not significant. Performance using multiple ports was predictive of SPLS performance for both peg transfer (r=0.78, p<0.01) and suturing (r=0.45, p=0.14). Conclusion: There was a degradation in performance when transitioning from traditional laparoscopy to single port. Innovative instrumentation may be helpful to perform certain tasks by providing triangulation. The FLS simulator can be used to measure performance, for deliberate practice and for objectively evaluating novel instruments. This platform may prove valuable for assessing the learning curve for novel interfaces.